Another FIFA World Cup is approaching and we have some intriguing games in prospect when the tournament kicks off in Brazil this summer. The World’s top strikers will assemble and whoever finishes as the competition’s leading goal scorer may well have won the trophy for his team. But who are the top scorers in the tournament’s history? Here is the definitive list. Brazil’s Ronaldo is on his own at the top with a total of 15 goals, spread over three tournaments. As a 17 year old, he was part of the national squad that won the 1994 final in the United States but he had to wait until France 1998 before really making his mark. Ronaldo scored his first goal at the finals in a 3-0 win over Morocco in the second group phase and would go on to score four times before he was mysteriously withdrawn from the final itself, after suffering a fit the night before. The centre forward was reinstated at his own request but was poor in Brazil’s 3-0 defeat. The prolific striker was back on form in 2002 and finished as the tournament’s highest scorer with eight goals before signing off in 2006 with a final three strikes. ‘Der Bomber’ was one of the most prolific goalscorers of all time and in 62 international matches for his country, he scored an incredible 68 times. 14 of those goals came in two World Cup tournaments, starting in 1970 when he was the leading scorer at the finals with ten. Six of those goals came in two matches as the striker scored back to back hat tricks against Peru and Bulgaria. Sadly for the West Germans, Muller’s goals could only take them as far as the semi finals but four years later, his modest tally of four helped his country lift the trophy on home soil. Veteran striker Klose is the one man on this list who is capable of adding to his tally, providing that the Germans take the 35 year old to Brazil. This would be his fourth tournament and back in 2010, he equalled Muller’s tally of 14 goals. 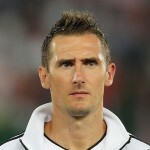 Klose has scored consistently in the finals, notching five in South Korea and Japan in 2002 before finishing as top scorer with a further five strikes at Germany 2006. 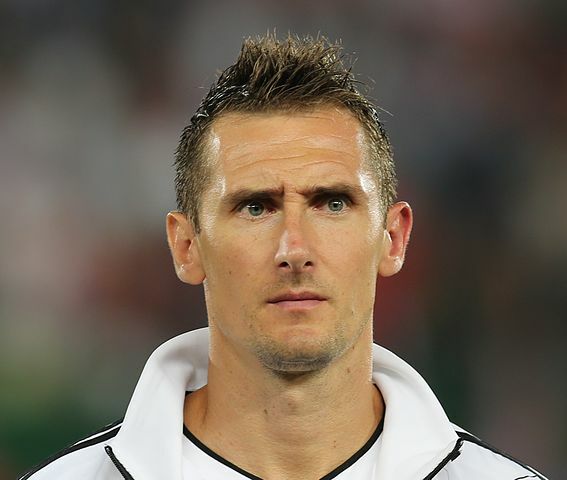 Klose failed to score in the semi finals as his country were knocked out but in 2010 he was back to add four more to his tournament total. Frenchman Fontaine’s tally of 13 goals is a remarkable one as they all came at one tournament. Nobody has since come close to matching his total at the 1958 finals in Sweden and in the era of modern football, perhaps no-one never will. The story goes that the Moroccan born striker wasn’t even wearing his own boots as he set the new record which began with a hat trick in a 7-3 victory over Uruguay. Fontaine followed that up with three goals over two matches against Yugoslavia and Scotland but his greatest individual performance came in the third place play off when the Stade Reims striker found the net four times in a 6-3 victory over the West Germans. Sadly, Just Fontaine was never to return to the World Cup finals and his playing career ended at 28 following a long period of injury. The 13 goals in Sweden ultimately contributed to an impressive overall record of 30 goals in 23 International appearances. Many will argue that Pele was the greatest ever to play the game and he climbs into fifth place on this list with 12 goals, spread across no less than four tournaments. The player seemed to improve with age so it’s a little ironic that his most prolific return came at his very first World Cup finals in 1958 when, as a 17 year old, Pele scored six times as his side won the tournament. Italians bringing his name up to number five on the all time list. German players feature on the all time scorers lists more than any other country and the deadly Klinsmann is in joint second place with 11 strikes overall. Like Miroslav Klose, that tally is distributed over three tournaments and his greatest success came at USA 94 when the former Spurs and Bayern Munich man found the net on five occasions. 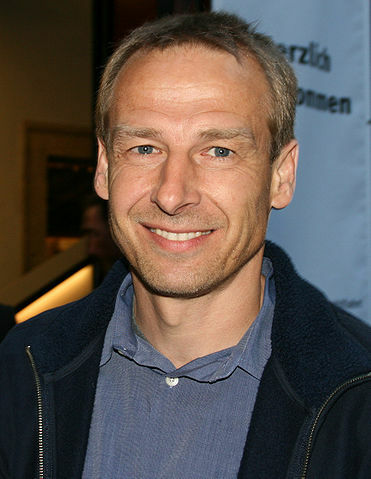 Klinsmann scored Germany’s opening goal of the tournament in a tight, 1-0 win over Bolivia and after finding the net again in a 1-1 draw with Spain, two more strikes proved crucial as his team overcame South Korea by three goals to two. A final strike came against Belgium came in the first knockout phase but Klinsmann and his side returned home after a shock quarter final defeat at the hands of unfancied Bulgaria. In 1990 and 1998 respectively, the striker scored three times in each tournament to bring that final total up to an impressive 11. Kocsis was part of the great Hungarian team that dominated international football for much of the 1950’s and like Just Fontaine, all of his World Cup goals came at one tournament. 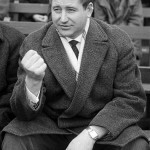 Hungary were expected to win the 1954 competition in Switzerland and made it all the way to the final where Gusztáv Sebes’ squad suffered a heart-breaking loss at the hands of the West Germans. Ironically, Sebes’ team had beaten the same opponents in the group stages by a thumping 8-3 scoreline with Honved’s Kocsis scoring no less than four times. The same player had notched a hat trick in his country’s earlier, 9-0 victory over South Korea before a double strike helped to knock out the emerging Brazilians at the first knockout phase. Hungary needed extra time and two more goals from Sandor Kocsis to ease past Uruguay in the semis before taking on West Germany in the final itself. 2-0 up after eight minutes, everything seemed to be going to the Hungarian plan but the Germans fought back to take the game 3-2. Crucially, Kocsis failed to add to his overall tally of 11 goals – a vital factor in his country’s defeat. Five players are locked together on ten tournament goals and the list is headed, in alphabetical terms, by Argentina’s Batistuta. The former Inter Milan and Boca Juniors striker also heads his nation’s World Cup scoring charts by two from Diego Maradona and his first came at the 1994 finals in the United States. 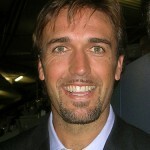 At the time, Batistuta was forging a reputation with Fiorentina but he announced himself on the World Cup stage in great style, scoring a hat trick as Argentina hammered Greece by four goals to nil in their opening match. The 1986 Champions and 1990 finalists made it back to back wins by beating Nigeria but needed at least a point against Bulgaria in their final group game. Unfortunately, a 2-0 defeat saw the Argentineans eliminated on goal difference and Batistuta was unable to add to his tally. 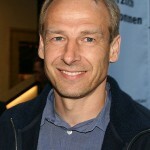 The centre forward came back to the World Cup with Argentina in 1998 and enjoyed his best return of five goals over the course of the tournament. 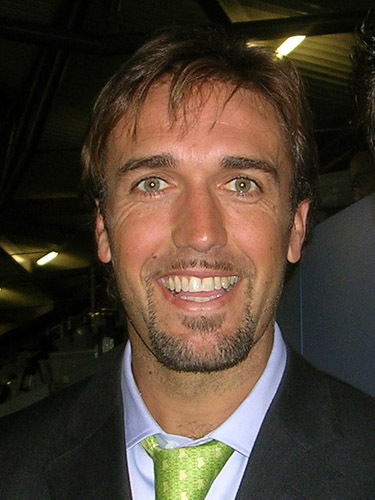 That tally included another hat trick in a 5-0 defeat of Jamaica and in 2002, the 33 year old Batistuta signed off with a single goal in the opening match in Nigeria. Lineker may have finished in second place in England’s all time goalscoring list behind Sir Bobby Charlton but taking World Cups in isolation, the former Barcelona and Spurs striker has 10 – five more strikes than anyone else. 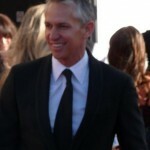 His journey began in 1986 when Lineker finished as the tournament’s leading scorer despite fears that he may miss the World Cup altogether after breaking a wrist in a game against Canada. England started the competition badly with defeat to Portugal followed by a goalless draw against lowly Morocco that left Bobby Robson’s team on the brink of elimination. Lineker hadn’t scored at this stage but neither had anyone else in an England shirt. Happily however, that record was addressed in the final group game when his hat trick against Poland ensured progression into the knockout phase. England were drawn against Paraguay and Lineker scored twice in a 3-1 victory before a final goal in the controversial ‘Hand of God’ game against Argentina. Four years later at Italia 1990, the Spurs striker scored four times as his country made it all the way to the semi finals. 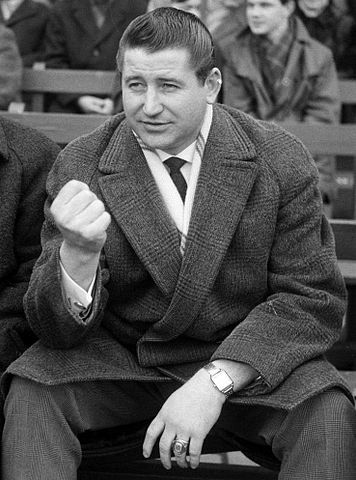 West Germany’s Helmut Rahn scored in the same third place play off as Just Fontaine as his side went down by six goals to three back in 1958. However, his own tally of ten was spread over two World Cups and began with four strikes in Switzerland, four years previously. 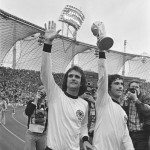 It was here that the Rot Weiss Essen forward made his most significant contribution in a national shirt, scoring twice as West Germany came from behind to beat Hungary in the final. The game was dubbed the ‘Miracle of Bern’ with Rahn firmly installed as the hero after a tournament that finished with four goals from the boot of the 24 year old. 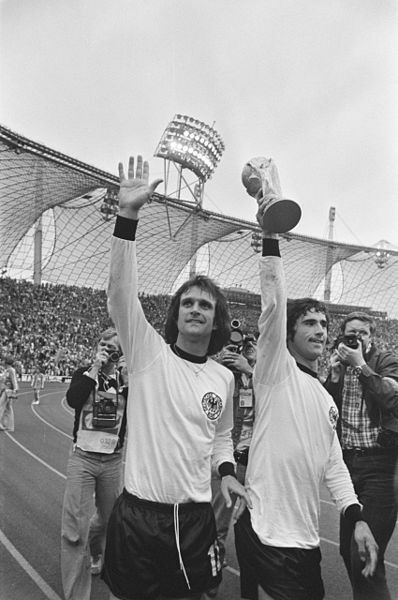 Four years later, Rahn and West Germany headed to Sweden to defend their crown and while the player’s individual achievement was even better, the country had to settle for a fourth placed finish after losing to the host nation in the semi finals. The striker had started the tournament well, scoring in every game in the group stages before netting the winner in the quarter finals against Yugoslavia. Crucially however, the Swede’s shut Rahn out in the semis and he signed off from World Cup football with 52nd minute goal in the third place play off tie. In scoring ten goals over three World Cup tournaments, Poland’s Lato is the only player to feature on this list without having been used as an out-and-out forward. That impressive tally includes the seven goals in 1974 that put him at the top of the scoring charts in that year and it all began with two strikes in a 3-2 win over a highly fancied Argentinean side. Two more followed in a 7-0 demolition of Haiti before Lato and Poland finished off an impressive campaign with the winger’s winner in the third place play off against the might of Brazil. The Stal Mielec player returned for two further tournaments, scoring twice in 1978 and once in Spain in 1982.